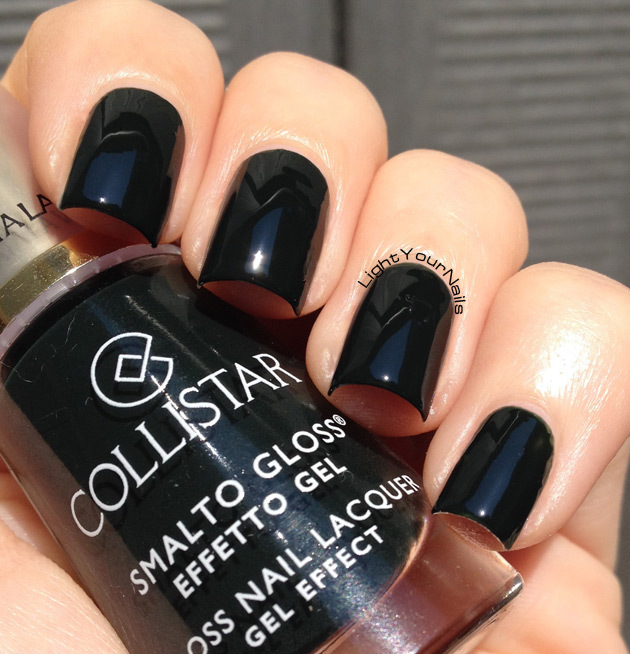 Collistar Verde Paola | Light Your Nails! I had to change my plans for today’s post but it’s ok! Fall is fast approaching, unfortunately I should add! And I keep showing you neons and holos. So to vary a little bit and meet you guys who like colder seasons I have a darker shade today. 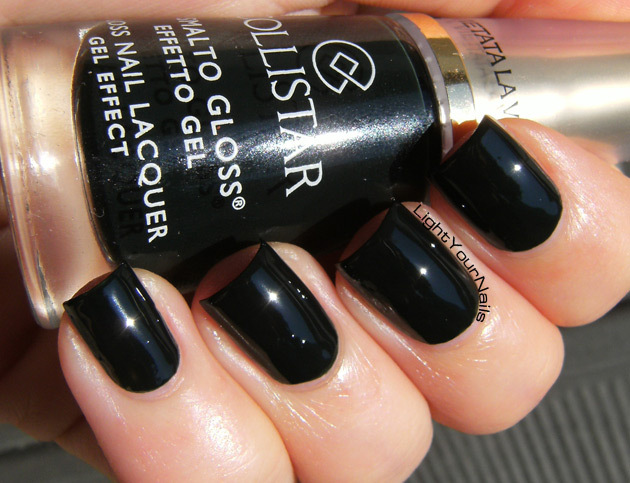 One of those shades that are way too dark for my taste. This is Collistar Verde Paola. 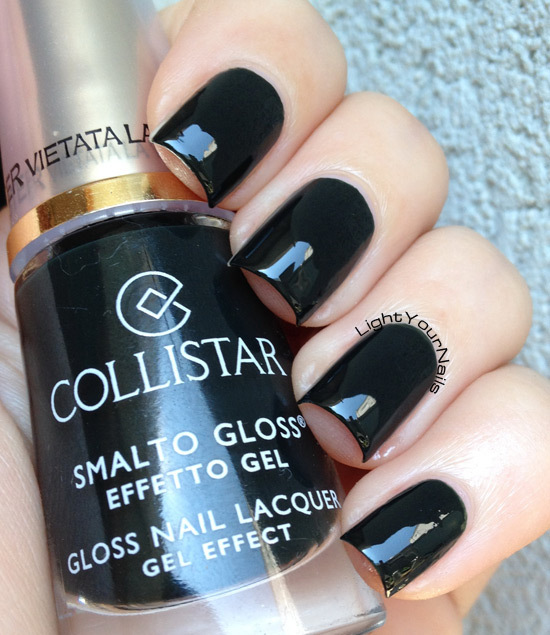 Collistar is a very popular and quite expensive Italian brand. Verde Paola is a blackened green creme. You know I love green, but I don’t like when a shade looks black instead than showing its real colour. And I swear you can’t notice this is a green even in real life. Formula was on the thick side and I had some troubles on my pinkie, you can easily tell from the photos. However it dries very glossy and I couldn’t avoid reflections on my nails, sorry! Stasera post non programmato, ma va bene così. Ultimamente continuo a mostravi smalti neon e olografici perchè non riesco ad accettare che l’estate stia finendo. Oggi per accontentare quelli di voi che amano la stagione più fredda ho scelto uno smalto parecchio, troppo scuro! Questo è il Collistar Verde Paola, una lacca verde talmente scura da risultare nera. Lo sapete che adoro il verde, ma non mi piace che uno smalto sembri nero invece di far vedere il suo reale colore. E vi giuro che questo smalto sembra proprio nero anche di persona. La consistenza è un po’ densa e ho avuto qualche problema a stendere lo smalto sul mignolo, si vede bene in foto. Però devo dire che asciuga davvero lucido e per questo non sono riuscita a evitare i riflessi sulle unghie. Are you ready for dark Fall colours? Or are you hoping for some more sunny weeks to rock your neon and holo manis? Siete pronti per i colori scuri? O anche voi sperate in qualche altra settimana di sole per continuare a sfoggiare smalti neon e olografici? I love its finish, so shiny ! That looks like a pretty one! Thanks for the suggestion! Concordo con te, ok il verde scuro, ma se deve risultare nero tout court, ciaone! Peccato perché la resa mi piace molto. E alla tua domanda rispondo: non scherziamo, non ho messo nemmeno la metà degli smalti holo che avrei voluto mettere!!!!!!!! Where's the green?!!! It is so aggravating to pay for an expensive polish and not be happy with it. When I was looking for a darkened green, I found Wet n Wild Poison Ivy. Wet n Wild is very inexpensive and I was very pleased with the polish - dark, but with an emerald glow. Poison Ivy has been in my wishlist for such a long time! I love that shade! Davvero un ottimo nero... ehm.... verde scuro!